Asheboro- Floyd Russell Welch, 85, passed away peacefully on Sunday, August 19, 2018 at Hospice House of Randolph County. 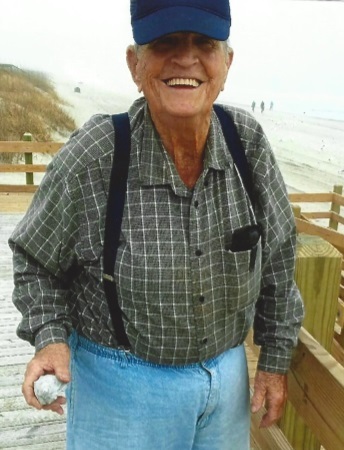 Russell was a native of Randolph County and a lifetime resident of Ramseur where he retired from his Supervisory position from the Town of Ramseur. He was a veteran of the US Army, serving his country during the Korean War. Russell loved the beach and doing anything outdoors, especially working on anything with a motor. He was loving, caring, giving husband, father, Paw Paw and friend to many. He was preceded in death by his parents, Vernie and Eula Welch, brothers Tate and Vernie Welch Jr, sisters Verlean Hoover and Ruth Yow. He is survived by his wife of 64 years, Louise Hall Welch of the home, daughters Teresa Welch of N. Myrtle Beach, Denease Walker (husband Doug), and Russelette Lyndon (husband Derrick) of Asheboro. Grandchildren Dustin Walker of Phoenix, AZ, Cody Walker and Hannah Lyndon of Asheboro. Also, a sister, Doris Pugh of Asheboro. Arrangements are entrusted to Midstate Cremation & Funeral Service of Asheboro. There will be a private service at a later date for the family. We would like to thank the entire staff of Hospice House of Randolph County who gave him and the family the most loving care. They were wonderful, caring and loving in every way.